In my humble opinion, this is one of the best stories of the classic literature. Those who agree with me will enjoy the game just as much as the book. Cursed Fates: The Headless Horseman is a nicely put together hidden object puzzle adventure game. The game is a typical hidden object puzzle adventure game. So you are in charge of finding out who this headless horseman is and why he is bothering this town. You are a detective sent to the town of Sleepy Hollow where a number of murders have happened. Digging in the past and in the personal stories is where the key lies. 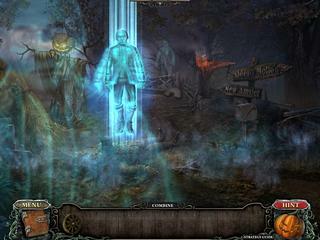 The game's audio-visual presentation is aimed at creating this mysterious atmosphere. And the goal has really been achieved by the developers. The ghost and locations look like they shood for Sleepy Hollow. The music and sounds are the same. 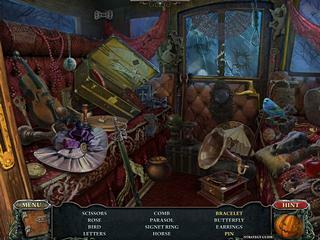 The game is a typical hidden object puzzle adventure game. There's a good number of the hidden object scenes. They are all interactive and challenging sometimes. Then there are mini-games that you not shockingly new, but still enjoyable. I guess the story is what makes it forgivable. There is also an extra challenge for you. You are collect horseshoes along the way in all scenes including the hidden object ones. The game is very enjoyable. You will find everything you would expect from today's HOPA games. This is Cursed Fates: The Headless Horseman review. Download this game here.